This recipe is sponsored by EZ Tofu Press. All opinions are, as always, 100% my own! Instant Pot Chili with Canned Beans and Tofu is one of my family’s favorite meals, and it’s so, so easy to make! 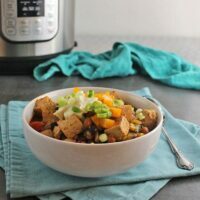 We have been eating this easy, delicious Instant Pot Chili with Canned Beans and Tofu once a week for months now! I love how it makes the house smell as it cooks, and I love that I don’t have to watch a pot on the stove. Instead, you just saute a few ingredients, then add the rest of the chili ingredients, and let the pressure cooker do its thing. PS – If you have leftover Instant Pot Chili, you can use it to make an awesome Leftover Chili Pie for supper tomorrow! You may be asking, “Why use canned beans in the Instant Pot?” Of course, you can make chili from dried beans in your Instant Pot, but it takes longer. Sure, it doesn’t take all day, like it would on the stove, but it still needs to cook at pressure for about an hour. 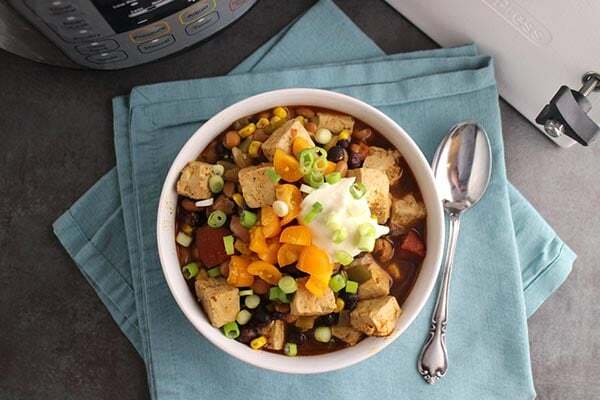 Instant Pot Chili with Canned Beans and Tofu cooks at pressure for just 8 minutes! Pressing your tofu makes a big difference when you’re cooking up this chili. As you guys probably know by now, I like to press mine with my EZ Tofu Press. 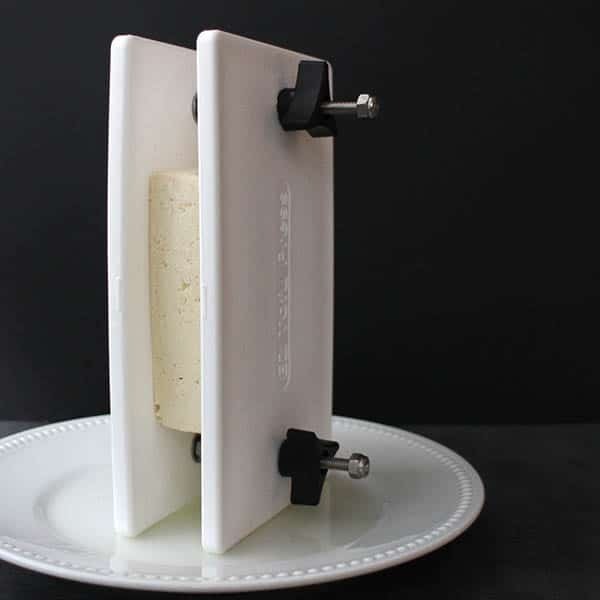 The EZ Tofu Press uses two flat boards that tighten together with screws to press the tofu quickly, thoroughly, and evenly. I like to start my tofu pressing before I prep my veggies and other ingredients for this chili. That’s more than enough time! 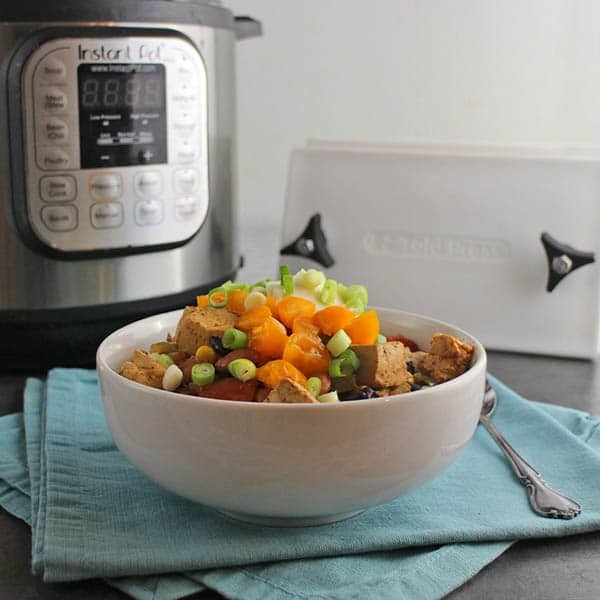 When you press, you get the water out of the tofu, which makes it much firmer and better at standing up to the heat and pressure in the Instant Pot. Plus, when you press your chili, you’re making more room for it to soak in the tasty broth flavors as it cooks. You’ll end up with much more flavorful tofu if you take the few extra minutes to press. This recipe makes about four to six generous servings. For my family of two adults and a preschooler, we get three suppers and two adult-sized lunches out of this pot. I’m erring on the conservative side with this recipe and calling it four servings, but you can definitely stretch it out depending on the toppings that you choose. Like most chilis, the toppings are my favorite part of this recipe. I think that’s what makes chili such a crowd-pleasing recipe. Everyone can mix and match toppings to create their own perfect bowl of cozy, beany, goodness. SO! Choose your toppings, pull out your Instant Pot, and let’s make some chili, y’all! Instant Pot Chili with Canned Beans and Tofu is one of my family's favorite meals, and it's so, so easy to make! Turn on your pressure cooker to the saute function, and add the oil. Saute the onion and bell pepper for a few minutes, until the onion turns translucent. Add the garlic powder, salt, chili powder, and cumin. Give a quick stir, then add the tofu. Toss the tofu with the spices for 2 minutes. Add everything else but the salt, pepper, and toppings. Stir, and lock your pressure cooker's lid. Bring to high pressure for 8 minutes, then do a natural release (10-15 minutes). Adapted from Dad Cooks Dinner. Creamy Buffalo Chili Variation: If you love Buffalo sauce like I do, I highly recommend adding it to this chili! Just add about a tablespoon to your bowl, if you're craving some heat. I like to offset the spicy, vinegary Buffalo sauce with a dollop of vegan sour cream. So good! I am not accustomed to cooking with tofu, but this chili was amazing! I threw in a tablespoon of cocoa, a splash of wine, and a little honey at the end. It was probably the best chili I have made. Thank you for this recipe! Ooh I love cocoa in chili! So glad you enjoyed it. We had a guest in who has recently adopted a strict vegan diet (no added oils) to address health concerns. 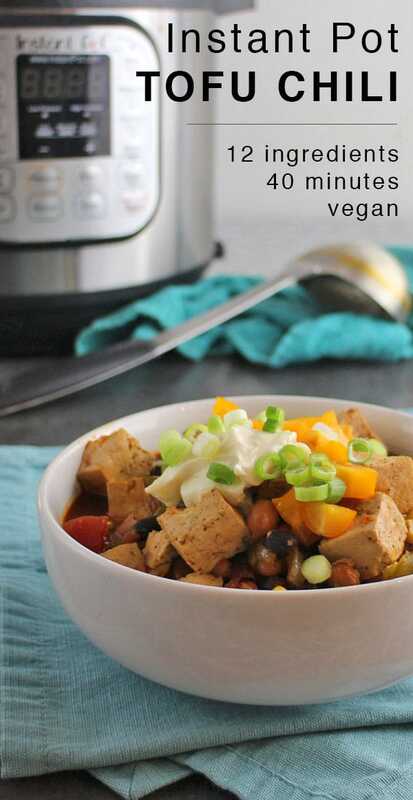 I bought tofu and many vegetables and googled “tofu vegan chili instant pot.” This recipe popped up, and it was so simple and flavorful. The guest enjoyed it and asked if she could pack the leftovers for her lunch and dinner tomorrow as she heads back on the road. The only modifications I made were no oil to saute the onions and peppers (added a little water instead) and some Mrs. Dash’s original seasoning since I did not have the Not Beef Cube. I do not own a tofu press, but I bought extra firm tofu. It held up just fine. We spooned the chili over potatoes and acorn squash (also prepared in the instant pot). Thanks for sharing your recipe. It was a success! I tried this yesterday – my IP kept displaying ‘burn’ message. After some online research, I found out that there should have been NO stirring after adding tomatoes. The sauce get too thick and not enough steam can build up. 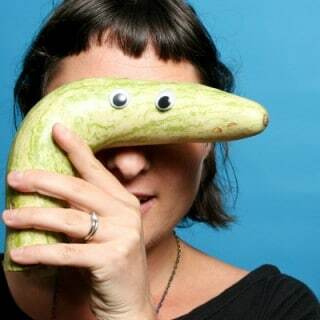 So strange! I’ve never had that happen. Thank you for sharing this experience, in case it happens to someone else though. What kind of IP do you have? So excited to try this once my Instantpot arrives! I think it’s supposed to get here today. This looks so simple but tasty – my kind of meal! I’m excited for your IP to arrive! You’re going to love it! Hooray! Enjoy your new IP! Love this! And I use canned beans as a short cut all of the time! Sometimes you just need something quick—and this looks like just the thing! Totally! I had such a hard time finding any chili recipes for the IP that used canned beans, and zero vegan ones. The IP uses less water bc it doesn’t lose steam. The tomatoes add liquid, also. 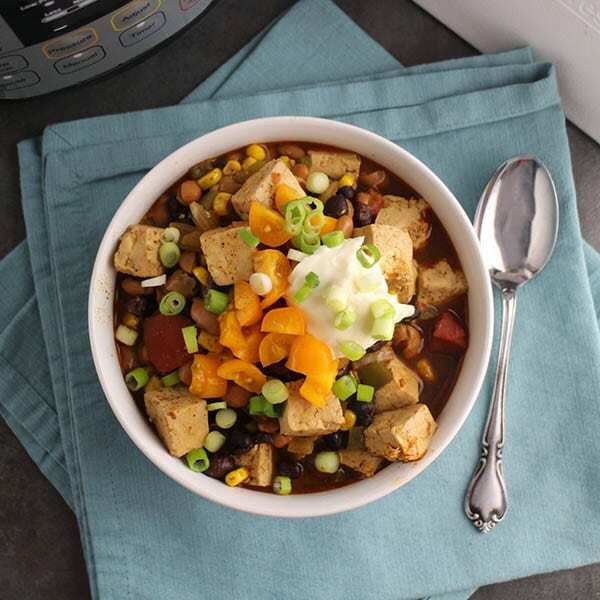 I’ve never made chili with tofu, but I love the idea! I need to break out my instant pot and try it! I am adding this recipe to my list! What a delicious looking chili. And it’s so easy to make! Please sign me up for your newsletter/notifications of new posts. This recipe looks amazing!